Create a long-range, high-performance Wireless-N network from a wired connection - PoE powered. The AP150WN1X1OD Outdoor Wireless Access Point lets you create a long-range 150Mbps Wireless-N network outdoors, through a wired network connection, providing wireless connectivity for mobile devices such as Smartphones, tablets, and laptops.This PoE-powered access point comes complete with a PoE Injector, so it can be conveniently installed in locations where a typical power outlet is unavailable. For versatile outdoor installation, the weather-resistant housing is pole and wall-mountable.The AP offers an internal 1T1R 12dBi directional antenna with adjustable output strength to suit your required coverage area. The access point also integrates an optional RP-SMA connection so you can attach an external antenna and a secondary LAN port to connect to an additional wired network device, if needed.Supporting wireless data rates up to 150Mbps on the 2.4GHz frequency, the high-performance wireless AP is compatible with 802.11b/g/n devices and offers support for WEP, WPA, and WPA2 authentication. The wireless access point incorporates an easy-to-use web-based utility to provide several customization options such as multiple SSIDs, remote firmware upgrades and Wireless Distribution System (WDS) mode support which can mesh multiple APs together to cover larger areas. The AP150WN1X1OD Outdoor Wireless Access Point lets you create a long-range 150Mbps Wireless-N network outdoors, through a wired network connection, providing wireless connectivity for mobile devices such as Smartphones, tablets, and laptops.This PoE-powered access point comes complete with a PoE Injector, so it can be conveniently installed in locations where a typical power outlet is unavailable. For versatile outdoor installation, the weather-resistant housing is pole and wall-mountable. The AP offers an internal 1T1R 12dBi directional antenna with adjustable output strength to suit your required coverage area. 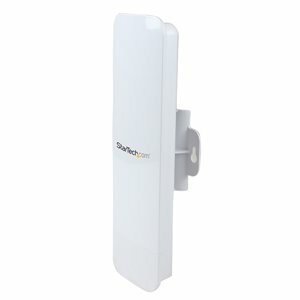 The access point also integrates an optional RP-SMA connection so you can attach an external antenna and a secondary LAN port to connect to an additional wired network device, if needed.Supporting wireless data rates up to 150Mbps on the 2.4GHz frequency, the high-performance wireless AP is compatible with 802.11b/g/n devices and offers support for WEP, WPA, and WPA2 authentication. The wireless access point incorporates an easy-to-use web-based utility to provide several customization options such as multiple SSIDs, remote firmware upgrades and Wireless Distribution System (WDS) mode support which can mesh multiple APs together to cover larger areas.